Marion Bay is one of Yorke Peninsula’s hidden treasures and has a coastal atmosphere you will want to come back to time and time again. Stay with us at Marion Bay Holiday Villas in one of our clean, comfortable and spacious 1 bedroom villas while you explore the hidden treasures of nearby Innes National Park, head out for a memorable fishing session, go for a surf, or simply stroll along our pristine beaches. Enjoy fresh, clean air, bird song and stunning natural beauty in a town that will take you back to a time when life was simpler. It won’t take you long to realise why the locals are so happy, you will leave feeling refreshed and ready to face the world again. That is if you leave at all, Elaine and I didn’t. After 2 years traveling around Australia we settled here and haven’t looked back. Meters away from the local beach within an easy 5 minute walk. Guests are asked to supply sheets and towels only. Laundry access upon request only. The villa was spacious and clean, the bed comfy and I liked the BBQ facility. The TV worked well and the shower was good. The site was close to the water, but we were a bit disappointed that there was no ocean view. The Tavern has nice meals and a pleasant outlook, but Marion Bay was possibly a little TOO quiet for our tastes. Not being outdoorsy, boating and fishing types, we found other activities a bit limited. I was unlucky in that my leg became infected, so hiking any distances in Innes National Park was out of the question. Clearly the villa and its surrounds lend itself well to families, as there is plenty of room for kids to play and groups can socialise in more comfort that at the neighbouring caravan park. The verandas on the villas are well placed to catch the sea breezes and I managed to get some quiet reading done in comfort. Sadly, my leg needed attention, so we had to leave early. I would consider returning in the future, possibly with friends in tow, as it is a good place to relax, with a big BBQ to cook feasts and space to socialise in comfort. The nearby general store has most of the basics, except that white sliced supermarket bread is a bit poor. Perhaps that is what the normal demographic wants. There was a very persistent seagull hanging around, looking for a feed. Good thing I like to keep my BBQ chips and meat to myself. I can't be responsible for letting the wildlife to get too fat to avoid predators. The holiday villas where perfectly sized, very clean and tidy. We loved the balcony, and being able to wake up early and sit out there with our coffees. The manager Shane was very prompt at responding to my enquiries before we arrived and everything was sorted for us to simply arrive and enter straight into our villa. Close to National Park, and lots of nice spots. Corny Point Neptunes Surf where great for board and wetsuit hire. Marion Bay Tavern had great meals, but would reccomend booking in early as the wait times where ridiculously long. Thanks for a memorable weekend. 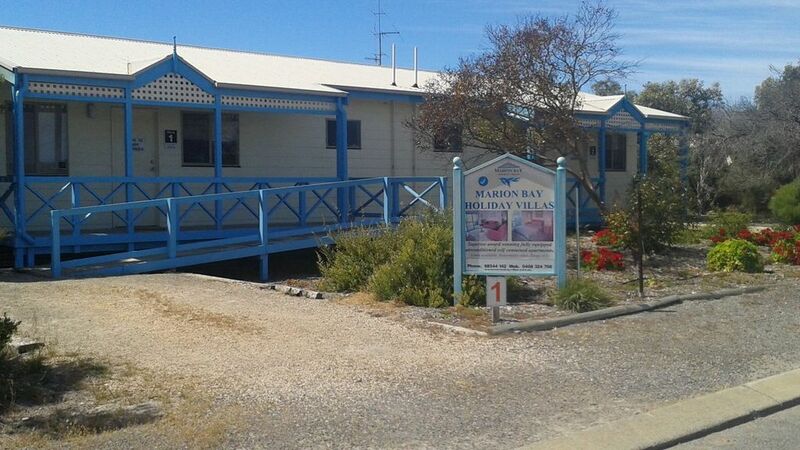 On the doorstep of Innes National Park, Marion Bay offers a relaxed atmosphere perfect for a complete battery re-charge.